I loved these - before I say anything else, I have to say that... They are SO delicious. They are sun ripened and slow roasted tomatoes - they are deliciously sweet and succulent and very flavoursome and juicy. I ate some straight out of the jar and they really are supremely delicious. My husband tried them too and really enjoyed them. In general, I wouldn't eat peppers on their own - I can only generally tolerate them as an ingredient in different foods, so I was pleasantly surprised when tasting these as I thought they were very nice. 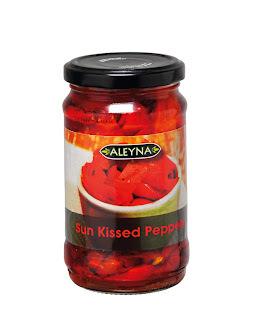 Although I preferred the tomatoes in the range, I very much liked these peppers too. Again, they are slow roasted and are very soft, succulent and tasty. They also have a touch of oregano and garlic which just intensifies their delicious taste. As with the tomatoes, I tasted these peppers straight out of the jar too. My husband really enjoyed these and I had to take them away from him quickly to stop him eating the whole jar! 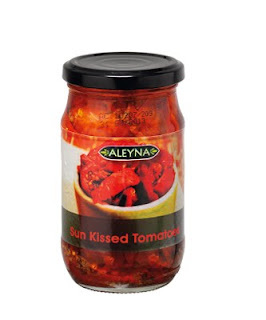 3) Tweet the following "I want to win the Alyena Sun Kissed range with @MyRandomBlurb Enter here http://bit.ly/kD7aaa #MyRandomBlurb"
Competition ends on 16th June 2011 and is open to UK residents only. Am following blog and have tweeted @LindyHine. These sound lovely and I think they'd be nice mixed through pasta with some olives, sliced mushrooms, bacon (or chicken, tuna, salmon, ham - it's very versatile this!) and pesto. Sprinkle some parmesan on top - delicious! I've never tried them before but I'd incorporate them into my Spanish Chicken meal. I would use them in a chilled potato salad. That will be nice. I'd try these popped & chopped onto pizza. I'd toss these into a pasta dish for a delicious kick! Never tried before, but would make a italian style souce. I follow your blob thru GFC.And i tweeted your post @sandigled. I would make bruschetta with the tomato`s and pepper`s they sound ideal. I have not tried them but i am going to look out for them now.